I went to the post office to finally mail out all the trades I owe people, some I still owe more cards I think, and found bubble mailers in my mailbox. My favorite kind of day-eBay deliveries. I picked up the first and so far only 2009 Allen & Ginter cards I own on eBay the other night and they arrived very quickly. It was a 2 card lot that I won for a somewhat pricey $6.23, however I figure if I try and buy these at the show in August it will cost me more. 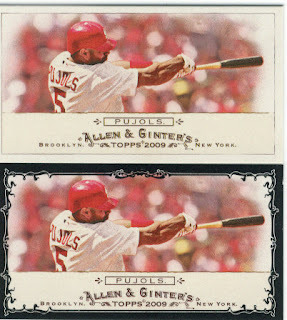 I also will not say that when I was in Target last night the 6 blasters of 2009 Allen & Ginter on the shelf tempted me. I was even holding one despite my stance on banning opening this product for fear of ferris wheels and beavers. I ended up with my usual and moved on, which you'll hear about later. Then the next envelope was another eBay gem. It was from the 2009 Lgendary Cuts, another set that I own zero cards from so far. I would like to open some packs of this, but it's just too much money and I can get the cards I want at the show instead. 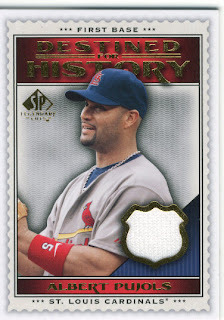 I got this one for $4.50 and thought it is a white jersey swatch, I really like the design on the card. It does resemble a stamp, but something about it just strikes me the right way. The final piece in my mailbox is a card that I have been waiting for since I first saw it. Dan from Grand Cards sent himself on a mission to find me this card and he came through. Me and Dan are best trading buddies lately. This card made my day, not that the others didn't but I have been waiting for a while to get my mitts on it. 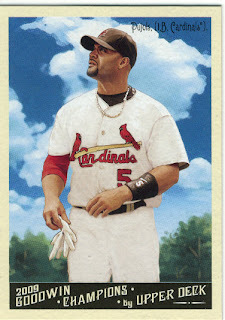 A 2009 Goodwin Preview Albert Pujols. If anyone has any 2009 Icons of my guys, or Legendary Cuts please let me know. Boy am I glad you saw that! My brain was not working well last night, I was studying, writing this blog, and on the phone.